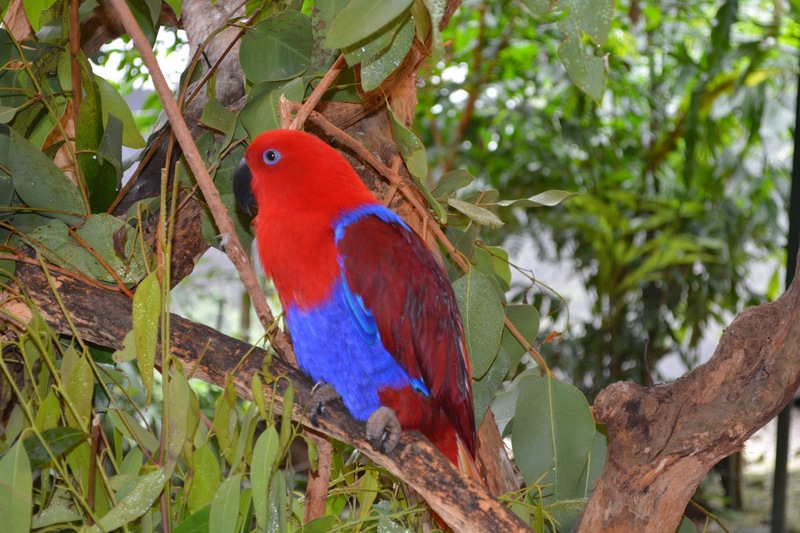 We arrived in Cairns, Australia at one of the hottest times of the year during the transition between summer and fall. It was a BIG change from New Zealand—where we had sunny cool breezes and now were in hot sun and high humidity. The drive along the coast from Cairns to Port Douglas was windy, twisty, and very scenic. The scenes alternated between groves of fruit trees, overgrown jungle, and sandy beaches fronting the azure seas. As you may recall from previous windy, twisty roads, Bella gets motion sickness sometimes and it is usually in the car. She was starting to feel sick on this road so we frantically searched for the motion sickness wrist bands and Dramamine and luckily between these and a rest stop—she did NOT throw up—YEA! We arrived at the Cayman Villas and were happy to make ourselves at home in our spacious two bedroom condo. Being in a condo with a kitchen and a washing machine is such joy—who would have thought these were the things that would be so appreciated?! Jared went to the grocery store to get supplies and found a small blender to make smoothies in as well, so we were in complete heaven. 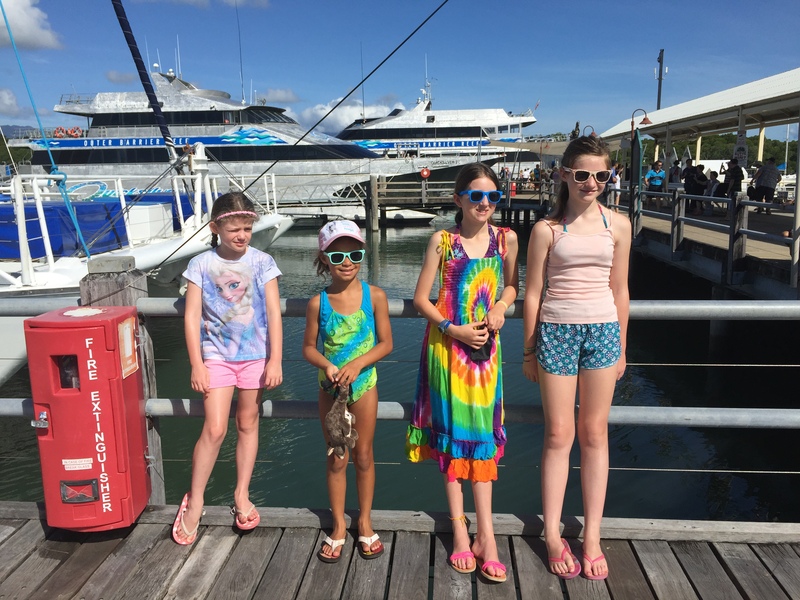 We spent our days in the sweltering heat of northern Queensland staying cool at the pool, on the reef in a boat or snorkeling, at an animal reserve, and visiting the Mossman Gorge. Our hosts at the condo were very helpful with recommendations and helped us book many of our activities. We didn’t realize that at the end of summer in the north of Australia is slow time….so everything shuts down –meaning many restaurants and shops were closed. It was great that we didn’t have crowds to contend with and hopefully we didn’t miss too much with the places that weren’t open. We met another family on holiday from Northern England and they had three daughters with them—two of the girls were around Lilli and Isabella’s ages so the kids had fun swimming in the pool with their monofins pretending to be mermaids. Our two families grilled out at the pool BBQ—the kids swam until dark and we all had fun having dinner together and sharing stories. The Great Barrier Reef was an amazing experience! When looking for boats to take out to the barrier reef, there are many choices, and many of them are high-speed large vessels that hold hundreds of people—which seemed to lack character. The sailing cruise we chose had character and some history of adventure as well! The boat was refurbished after apparently spending some time at the bottom of a harbor some years back. It resembled the Black Pearl (from Pirates of the Caribbean) and had two large sails, one smaller one in the front and an all wooden hull heavily coated in varnish. We started to think the varnish was actually all that was holding the ship together in a few places. The boat was about 30 feet in length and held 20 passengers comfortably. It was definitely seaworthy but a little rough around the edges. The advertising oversold the amenities on the boat a bit and this was pretty obvious from the get go when Kim was handed a steaming and “streaming” cup of coffee in a chipped and cracked mug. with the coffee seeping out of a big crack on the side. The captain explained that “just the day before” the ceramic mugs had fallen off the shelf and they were “very expensive” to replace so he had only bought four new ones and was “making due”(WHAT?!!) Two things came to mind: 1. If he skimps on mugs—what else has he skimped on and will any of it affect our safety? 2. At home we have ROWS of mugs received at our workplaces over the years (of course my favorite mug is my blue Micron “Crucial” travel mug, thank you Nick Bicandi!) and I’m thinking maybe I should send some of our extra mugs to the captain. To make things even more interesting, the captain appeared to have partied a little too hard in his colorful past and he had a problem maintaining his train of thought while making his presentations on the boat—not just once…. but pretty much every time he spoke in front of the group. Not super reassuring as he’s drifting off in the middle of his explanation about safety features of the boat and the coastline behind us was rapidly disappearing. Luckily all went well with the sailing so we got out to the reef and back safely…and saw some amazing fish and marine life! The boat was manned by a small team of 20-something girls from Sweden—all blonde, tan, gorgeous, and very nice! 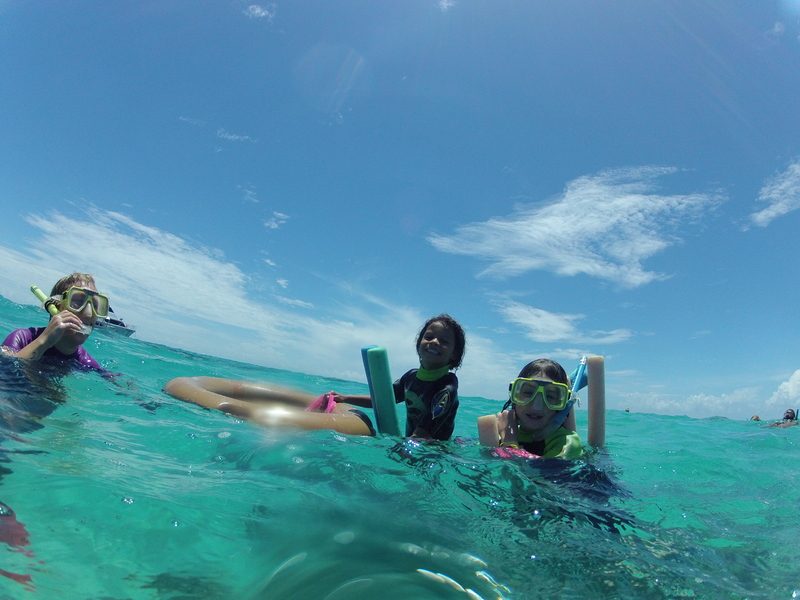 They were fantastic with Lilli and Isabella and made sure they felt comfortable snorkeling on the reef. Lilli put her mask and snorkel on and was off to the races with a noodle to help her float. Isabella had a few more trepidations and didn’t like the snorkel and mask—so she found her happy place with her regular swimming goggles on. One of the Swedish girls stayed with her the entire time and pulled her around on a floating ring. We had two snorkels at different locations and by our last snorkel, Isabella was holding her breath and free diving down and to get a closer look at all of the colorful fish. 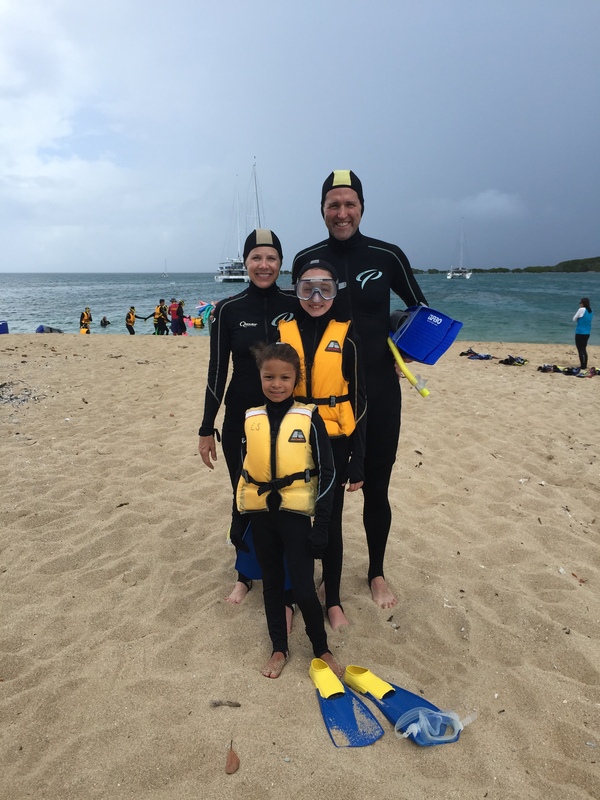 We saw pufferfish, sea urchins, clown fish, and parrot fish that ate the coral… it sounded like they were eating a bowl of Grape Nuts cereal. Lilli and Jared followed one of these noisy eaters around for several minutes, getting some good pictures and stories to tell. It was a windy day, so our biggest challenge (other than keeping the captain focused on his speeches) was not drifting too far away from the boat. The water was warm and we had plenty of sun to light up the coral beautifully and highlight all of the fish. Most of the fish didn’t seem to mind that we were there and at times it felt like you could reach out and touch them—which Lilli tried several times and ended up with only bubbles in her hand. The coral was impressive, varying in size, from small fist-sized bunches to sections that were more than eight feet in diameter. The colors ranged from lilac pink to mustard yellow and every color in between. The dead coral looked like rounded off unbaked ceramics and they all flowed together like a miniature mountain range just several feet under the ocean’s surface. It was easily understood why this reef is called by the name of “Great”, because it truly is enormous and amazing. As we headed back to shore, our eccentric captain served us boxed wine (the Australian version of Franzia) and cheese. The lovely vintage was served in the same leaky coffee mugs as earlier in the day. He made fun of the fact that he was serving us boxed wine and assured us the best way to drink it was a hybrid mix of about 40 percent red and 60 percent white, which he gladly poured for everyone. Jared gazed into his mug as the white and red swirled together to form a sort of rose. Kim just stuck to drinking water. Even with the quirkiness of the boat and the captain–it was a great day on the Great Barrier Reef and one of the highlights of our trip. 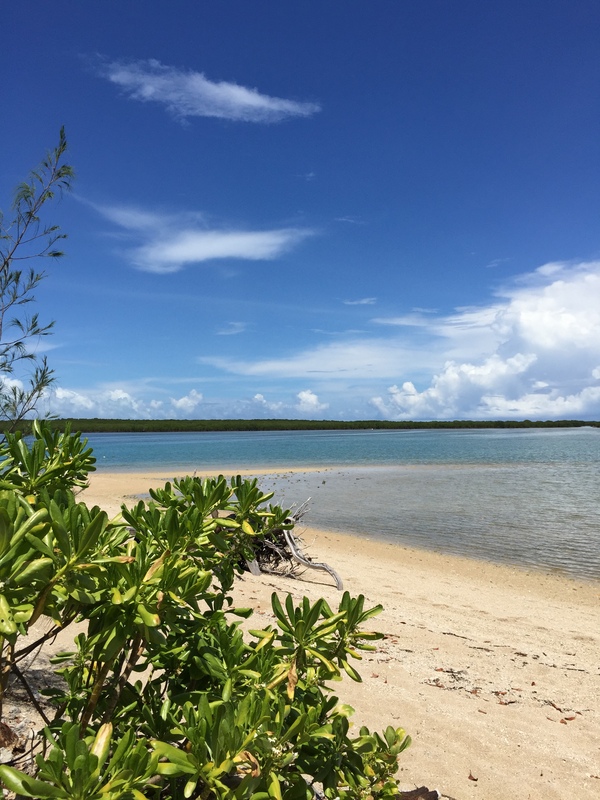 Later in the week we took another snorkel trip on a larger and spent some time sailing among the low isles—lots of turtles, sea cucumbers, a few sharks, and no rose. We walked right off the shore in our skin tight hooded stinger suits recommended because the warm summer months bring jellyfish to the reef and by the time you see them it’s too late. We looked like we were about to be the first family to step foot on Mars instead of the reef, but we proceeded into the water and swam about sting free (and yes we did see some jellyfish—they were quite large!) The coral at this reef was really close up as the water was very shallow and it made it easier to see the wildlife and coral. We found a lot of action going on in what initially appeared to be a quiet place. As the day went on, the tide went out and you had to be careful about where you swam so you didn’t touch the coral or get stuck on it. After being in the Galapagos and the Great Barrier Reef, we’ve gained a much stronger appreciation for sea life. Seeing these wonders is a privilege and should be treated with the utmost respect. The Great Barrier Reef is being cared for as far as we could see…but there are places on other continents that we visited where the sea is being completely abused and trashed. More on that later. 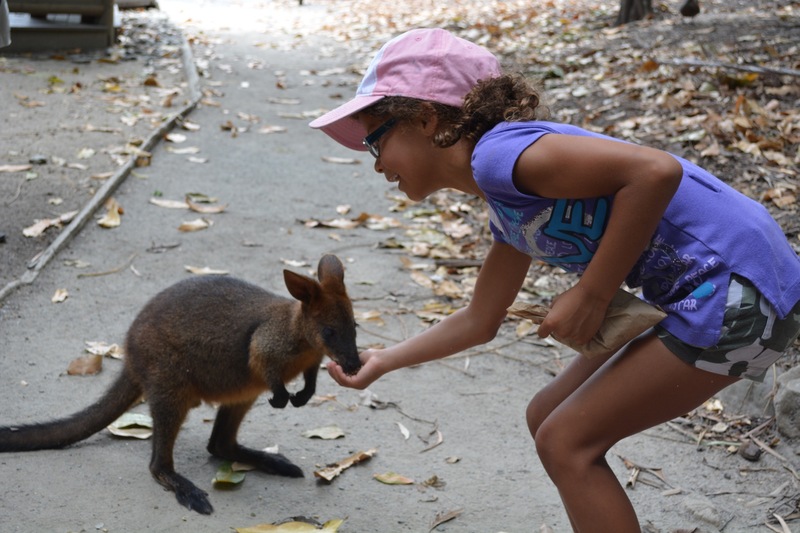 We had a special day where went to the wildlife park on the outskirts of Port Douglas. 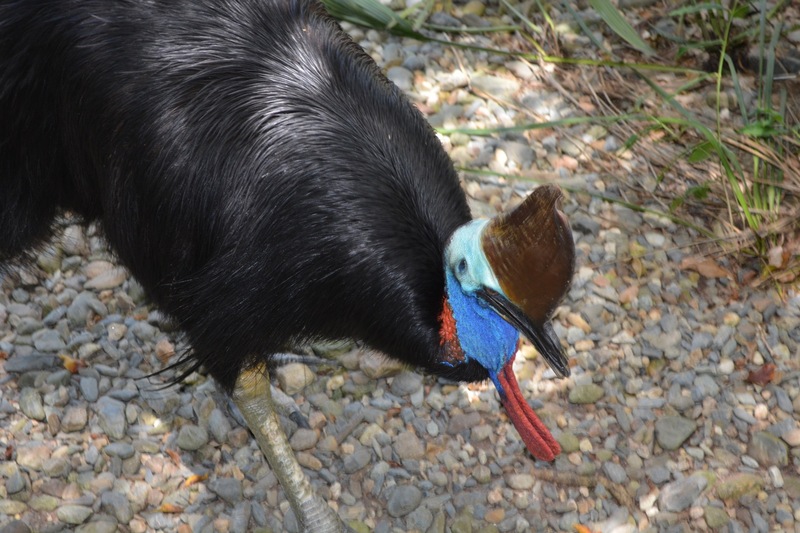 There were many animals the girls were excited to see—Kangaroos, Wallabies (look like small Kangaroos), Koalas, lots of birds, crocodiles, and the very interesting Cassowary, which looks sort of like an Ostrich with a very colorful head. 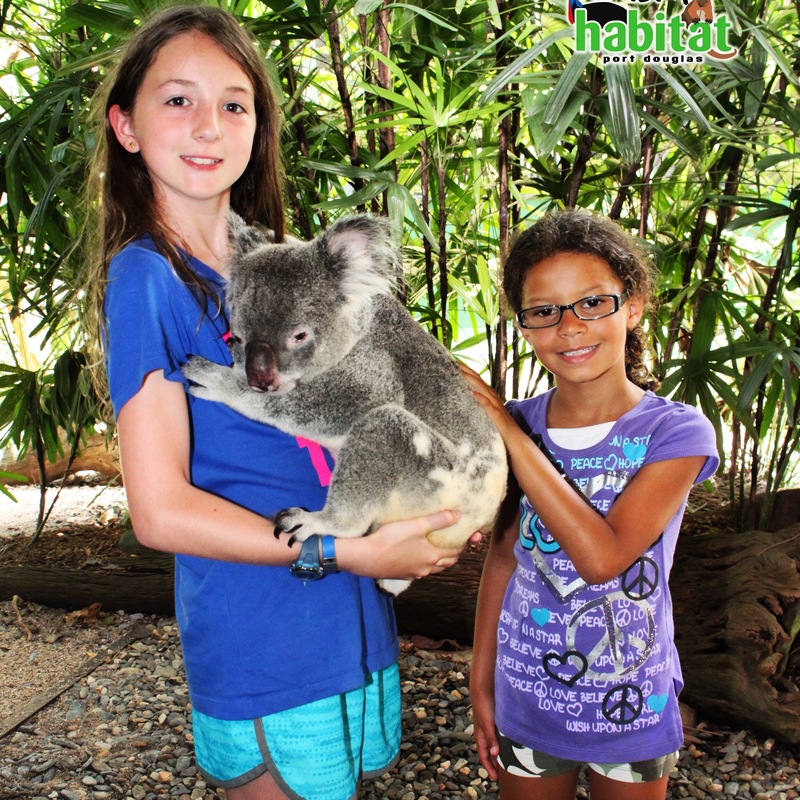 We captured a very cute picture of Lilli and Bella holding a Koala—Lilli said it was heavier than it looked! 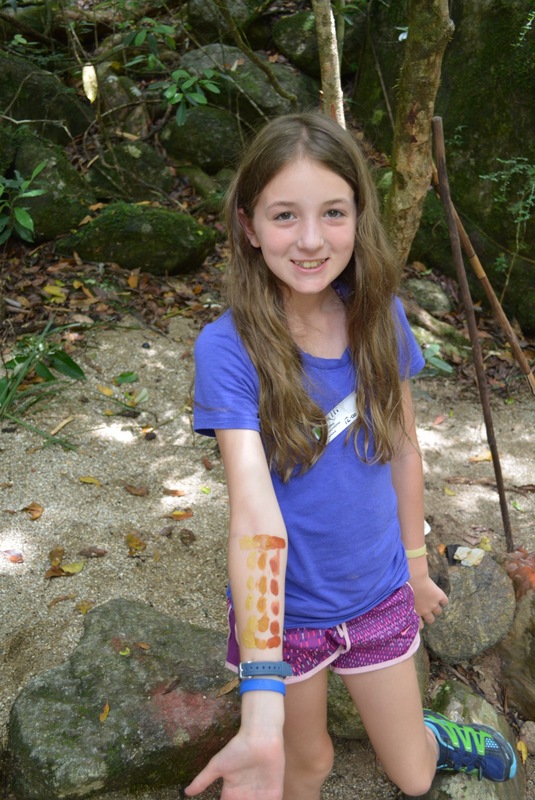 On one of our last days, we went to Mossman Gorge and went on a Ngadiku Dreamtime Walk—which is a storytelling ritual of the local Kuku Yalanji tribe of Indigenous Australians. You begin with an invitation from the chief to walk through the smoke of a fire to cleanse you and ward off evil spirits. After that, the story telling begins and our Dreamtime guide took us on a walk through the rainforest. He pretty much made us scared of every single plant and tree in there as he told stories of plants that make you blind, will kill you if you eat them, and scar you forever if you brush up against the wrong one. It was probably mostly for dramatic effect…nonetheless, we didn’t touch ANYTHING when hiking later that day on the heavily vegetated trail…no easy feat but we were seriously scared! 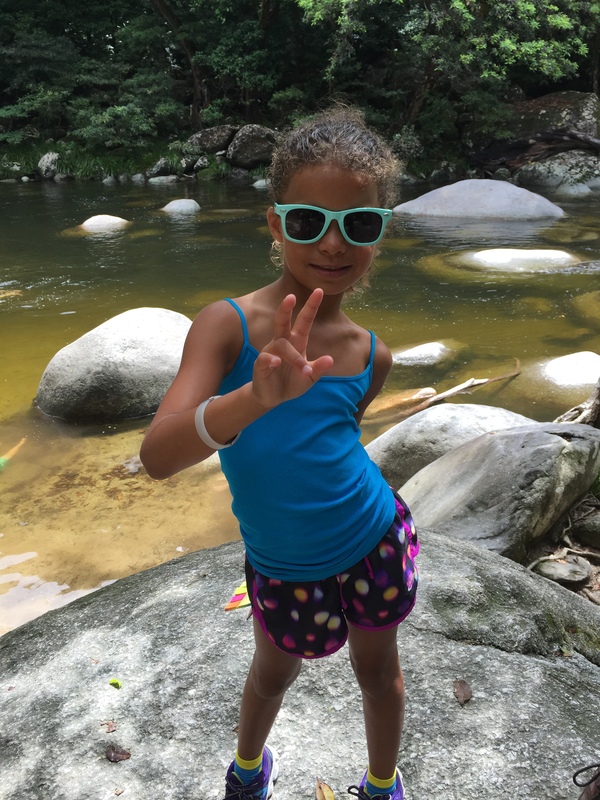 The highlight for the girls was a swimming hole in between huge boulders—very cool and refreshing. Our last night we had dinner at a place called Rattle and Hum with our new friends from England, celebrating their daughter Elizabeth’s birthday. It was very fun and we were sad to say goodbye so quickly to our new friends. The next morning we boarded our flight to head to Brisbane—a little further south near the coast and close to the Gold Coast. We stayed in a really cool high-rise apartment called Meriton. 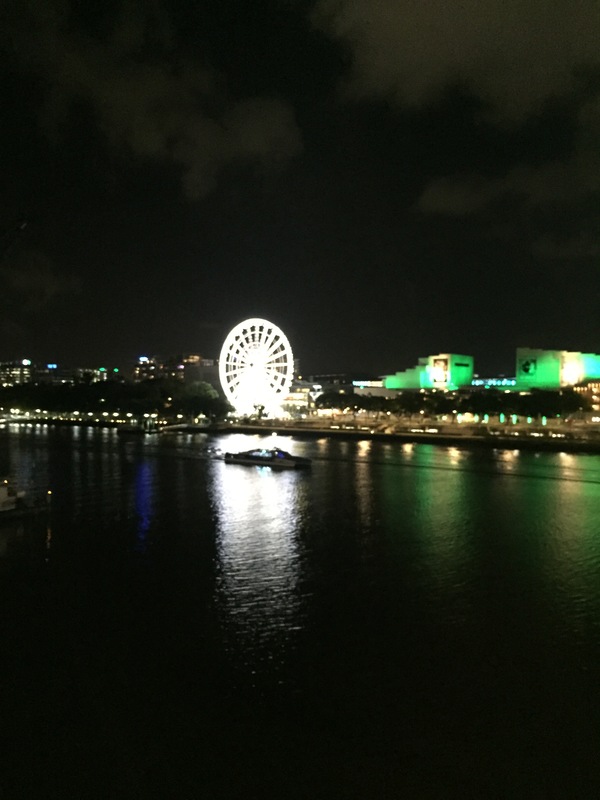 We had sweeping views of the city of Brisbane and the winding Brisbane River. 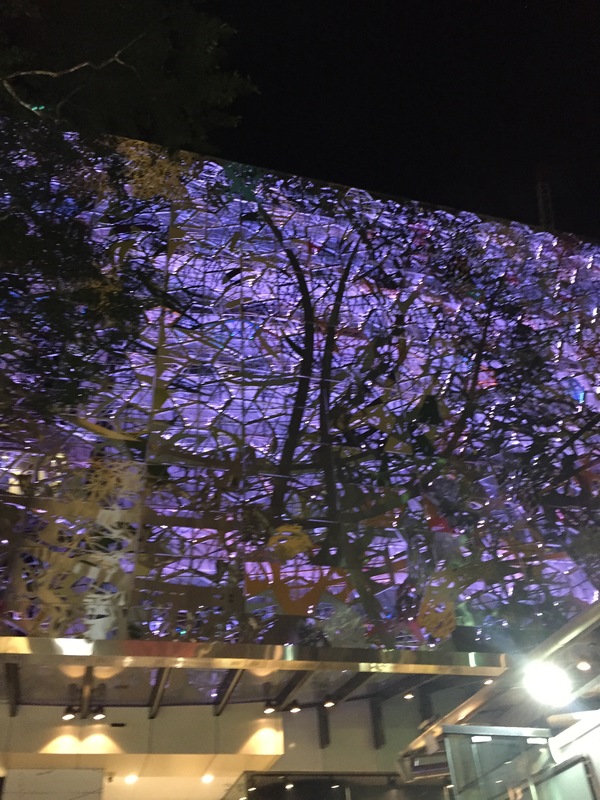 We walked the city and enjoyed spending time at Waterfront Place, which included a huge manmade beach and swimming pool, scenic Ferris wheel, and loads of shops and restaurants. 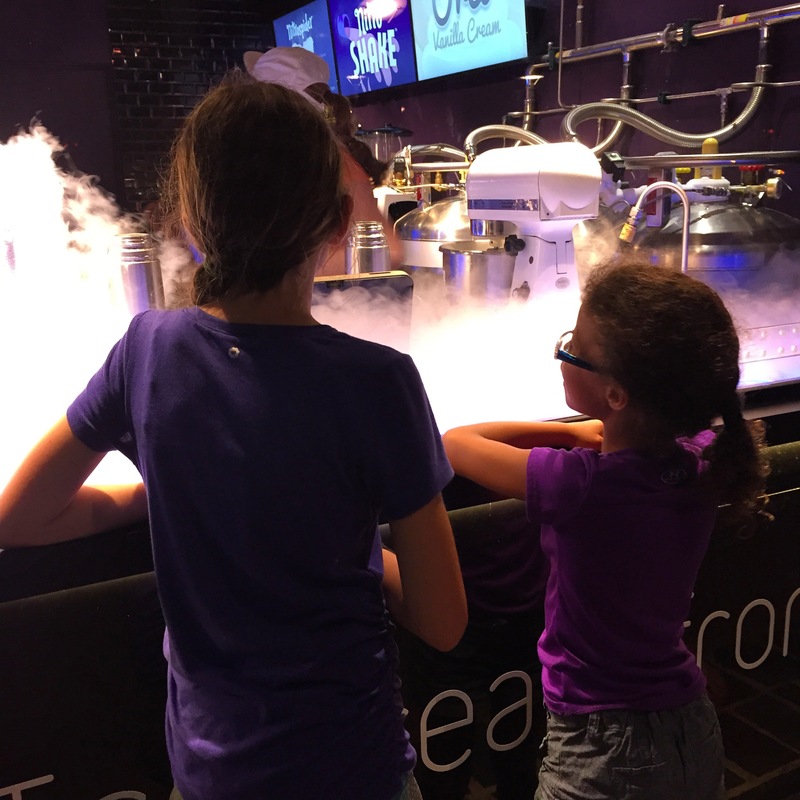 The girls especially loved the liquid nitrogen ice cream shop we went to one night after dinner—it was really fun to watch it being made and even more fun to eat! 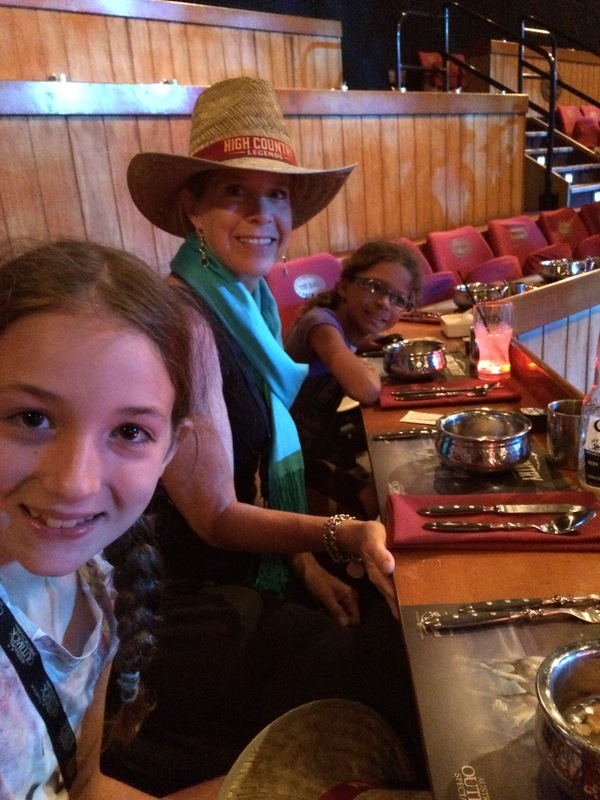 Our last night in Australia we went to the Australian Outback Spectacular (think Medieval Times with an Australian Ranch theme) near the Gold Coast. The girls loved watching the horses –they did a nice job incorporating a storyline into the history and had some very exciting riding and good music. The following morning we went to the airport and boarded our flight first to Sydney and then to Hong Kong on Qantas (our favorite airline!). We spent time doing homework, watching movies, and napping as we journeyed across the Equator to Hong Kong. 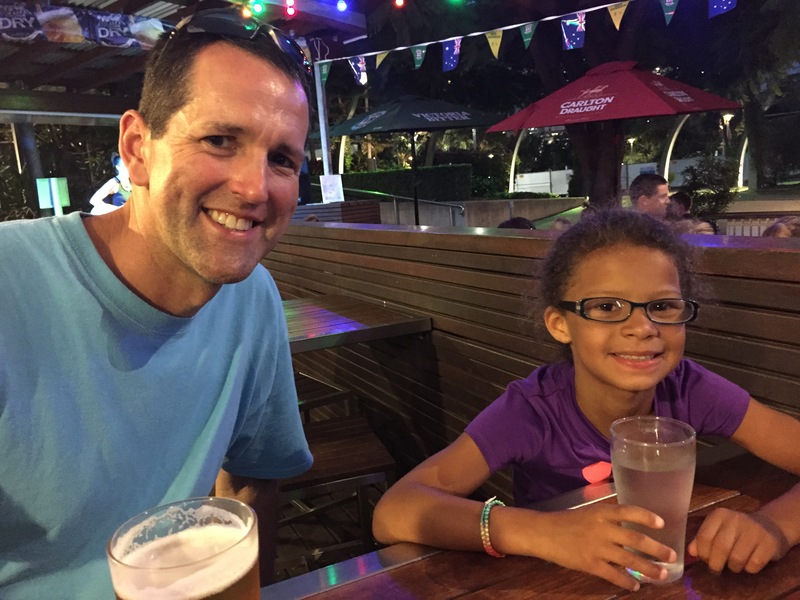 The girls still say Australia was one of their favorite places; between the beaches, wildlife, the Great Barrier Reef, and really nice and fun people, what’s not to love?! Next up–Asia–which was a big change and a great learning experience for us as a family–look for our next post soon!